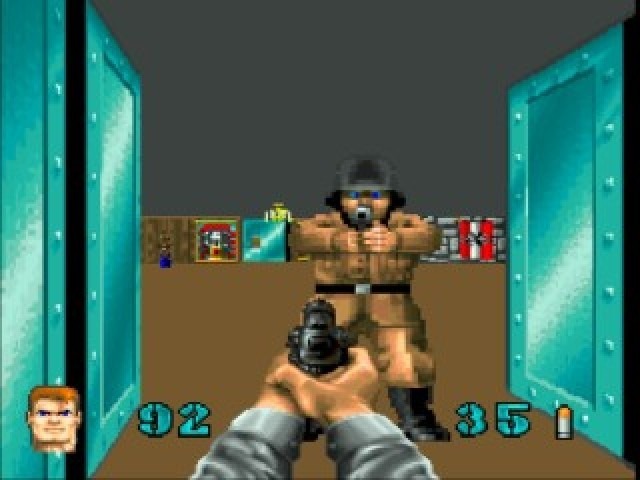 I liked the PC version of Wolfenstein 3D. Liked it when it came out. Liked it when I played through it for that review. But I couldn’t say that I loved the game, or had any particular desire to play through it again (as evidenced by a current lack of a Spear of Destiny review). So when I decided to review the Jaguar version, I expected to play a few levels, comment on what had changed, and move on. Imagine my surprise when I found myself still playing to the end. Wolf 3D for the Jaguar seems, upon first inspection, to be the version that didn’t need to be made. The PC original and the sequel were released two years before. Doom was already rampaging through the stores. Not to mention, there’s nothing particularly “64-bit” about Wolf. So why bother? Well, id had the code laying around, they had the money to throw at it to make more money, so I can understand a pervasive “why not?” Yet this doesn’t feel like the expected lazy cash-in port. Truthfully, it turns out to be an excellent version by any measure. But don’t pick this up expecting a totally rare adaptation available only to those who bought the Jag. It’s part of the “Wolfenstein 2.0” round of 1994 ports, which include the 3DO, Macintosh, and the SNES to some extent. Each of them are similar expansions of the original game, improving upon the PC original, but not being much different from each other. The fundamental game hasn’t changed much either, making it hard to recommend if you’ve already played the first. You get the same truncated missions here as the SNES and Mac’s “2nd Encounter” pack. 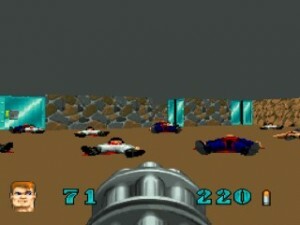 While the PC ran for 6 episodes with 10 levels each, the Jaguar missions feature only two or three levels and a boss, cutting the total count to about 30. The level design hasn’t changed, featuring the same 90-degree angles and floorless/ceilingless castles as in the PC. I honestly can’t tell you if there are any Jaguar-exclusive levels, because each and every level looks the same to me. That’s not meant to be a knock against the game – Wolf 3D is more about the little experiences and action moments within the levels than their rather bland, forgettable architecture. Still, the castles for each mission are meant to be different, and do manage to look a little distinct from each other by introducing new textures. The missions run in order and you cannot jump ahead, as you could in the PC, so the the transtion to a new castle becomes a little more apparent, and a little more important. Also, all missions are now presented with briefings from F.D.R. himself, so the plot (as it is) is now possible to follow. You also get the benefit of the same two new weapons featured in the other upgraded ports – the rocket launcher and the flamethrower. The rocket launcher is mostly good only for dealing heavy damage directly to bosses, but it will still take an abnormal amount of shells to knock them down. The rockets do have the curious property of not exploding until they hit a wall or boss character, meaning that they will drive straight through any standard foe and kill them as they pass. If you can ever get a mass of foes in a straight line (through a doorway, for example) then you might be able to put this to good use. Otherwise, the flamethrower is the way to go. It shoots rocket-like balls of flame at a chaingun rate. Each flame ball will kill a regular foe in one hit, making it a fantastic tool for crowd control. It’s also strong and fast enough for bosses, making the rocket launcher almost not even worth including. This raw power is offset by having limited fuel throughout the game. The major update, and the one worth considering this port for, is to the graphics. Characters now appear to have double the pixels, allowing them to feature more detail and maintain sharpness up-close. Details in faces and uniforms can now be clearly seen, down to the shine of leather on guards’ boots. The weapons in your hand receive an equally stark overhaul and look fantastic, though the pistol and chaingun seem “borrowed” from Doom. Gunfire lights up the surrounding metal, aiming sights and vent ports can now be seen, and the animations put more weight into the kick of the gun. The decoration textures have been polished as well, though this isn’t quite as apparent. You’ll mostly notice a cleaner look when pressed next to the walls, and though pixels can still be counted, the resolution has clearly been improved. The entire game now runs in full-screen, with the information bar removed and relegated to health and ammo icons at the lower corners of the screen. The speed doesn’t suffer at all, marking one of the few unmodded instances of this game fully playable in fullscreen. Though the increased viewing area is just opening up the top and bottom to gaze at the featureless floor and ceiling, it does allow walls and characters to fill the screen and flaunt their new detail. These cleaner graphics come with a small price. All enemies are now drawn from one angle (the front), so you will not find patrolling or turning enemies, or guards with their backs to you, as you could in the original. Admittedly, stealth never played a crucial role in the PC game. I personally never bothered to shiv a guard in the back, even though you could. Enemies do still react to nearby gunshots and open doors to investigate, and harder difficulty levels will put them in more positions to surprise you (like next to doors to shoot you in the back if you run through carelessly), but overall enemy resistance feels more sporadic in this version and guards seem spread thin. A small complaint, but it does feel a little less dangerous or tense compared to the PC original. Changing the difficulty only increases guards’ heartiness, not their numbers. The game sounds great. Guard shouts are stronger and cleaner, weapons bark out more appropriately. Music sounds ported from the PC and still MIDI, but the sound processor is better than even an early Sound Blaster. The most important difference is that notes now sound “deep” and have resonance. Individual instruments can now be picked out as well, and the slow, haunting remix of bars from recognizable American WWII war songs (like the “Marines’ Hymn” or “Anchors Aweigh!”) is still one of the better-fitting game tunes I’ve ever heard. Ditto for the awesome remix of Hitler’s theme. You also have the option to set the music volume independent of the effects, even to the point of turning it off if you so desire. Some of the voice assignments have changed, most notably the officer stole the machine gun guy’s SS line and the machine gun guy now barks “Hitler!” The lines also don’t seem to be re-recorded, just transferred from the source at a much higher quality than the PC. The flamethrower is a touch overpowered, but great fun. It’s breezy to control as well, though I find the older, original Jag pad to be a little too loose to be accurate. A tighter pad like the 6-button Pro controller fairs better. Such troubles are mostly because the engine is awfully fast and smooth, which can hardly be called a bad thing, but which does make you a little too quick for your own good. It’s hard to move and aim accurately. Fortunately, some level of helpful auto-aim does appear present. Firing weapons is handled with the B button, strafing/door opening with C, and running with A. You move around at a pretty quick clip anyway, so the run button really only comes in handy on rare long hallways or truly enormous rooms. The Option key cycles through your rocket launcher, flamethrower, and current bullet weapon. Your last bullet-firing weapon gets overwritten when you pick up an upgrade, so once you acquire the chaingun, you will never be able to go back to the machine gun or pistol. I was initially concerned because I liked to switch back to the pistol to conserve ammo, but this is not a hindrance in the Jag version. The chaingun really will be all you’ll need. The 1-3 buttons control three on-cart save slots. Pressing any of them writes your current settings instantly. The lack of a confirmation system makes it easy to accidentally overwrite a saved game, but it’s not likely you’ll hit any of these buttons by mistake. You should be more concerned about losing track of what game is in which slot, since there’s no way to tell. You can only load a saved game from the main menu screen, while dying simply starts you at the beginning of the level with the pistol and a handful of bullets. Since you can’t quickly load a saved game, you’re encouraged to accept your death and push on more so than in the PC version. The final and best feature is an automap on the 5 key. Pressing this shows the layout of the areas you’ve traveled, with icons replicating the textures on the walls. You will not see the key needed for a locked door, or any pickups you might have missed, but the map is absolutely invaluable in helping you find what areas of the level you haven’t been to yet. Again, this is a feature in all updated ports and not exclusive to the Jag, but it makes getting lost inside the game totally impossible. I am death incarnate, indeed! I can find no censorship in this version, except that the puddles of blood on the floor, and the skeletons in hanging cages, seem to be missing. I don’t think these were dropped for violence though, probably just to save cartridge space. Guards still bleed when shot and remain bloody corpses on the ground, Hitler and swastikas still decorate the walls, and angry dogs still stand ready to take a bullet. There’s also not any new violence or offensive content. There are no new death animations for the flamethrower and bazooka weapons, and by id standards, the gore here is tame. My major complaint is more of a caution – the changes in this version make for a different style of game than the PC original. 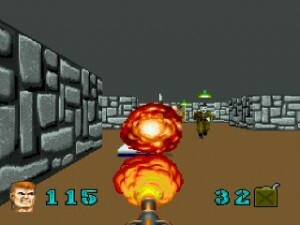 This port has clearly been influenced by Doom (which makes sense, given the time), and as such is far more action-heavy. 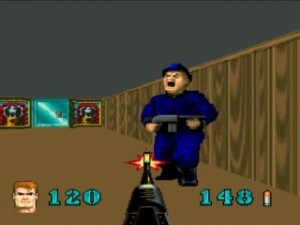 The PC original required some strategy, however minor, because it gave you a hard limit of 99 bullets. This version starts its cap at 150, with a familiar backpack pickup that can jump you to a new max of 350. All ammunition is easier to find and hoard. Lives have been removed, as has the point system. Without points, hidden treasure now gives a four-point boost to your health, with a maximum health of 200% (identical to Doom’s blue flasks). None of Wolf’s enemies were ever designed to go toe to toe against a player with 200% health and a chaingun with a sustainable supply of bullets. If you keep reloading your game on death, the game really has nothing to stop you. Even considering the change to a more balls-out attitude, this version is a blast to play. The graphics are spectacular, the sound brings the noise, and the controls are easy to handle. We’re still not up to “Must Own A Jaguar To Play This Game” status yet, especially considering that the majority of these upgrades are present in other ports, but this title should definitely go in the “Pros” column. Excellent additions and polishing to a classic game. Improved all around. Most improvements aren’t exclusive to the Jaguar, quite a bit of game blurring makes this more WolfenDoom than its own title. This one is said to be John Carmack’s favourite version, seemingly because it was faster than most (the first 3D game he wrote that ever displayed 60 FPS). I am still infuriated that Wolf4SDL for some reason does not have an auto-map! What’s a source port for?! I’ve read that Jaguar Doom was his favorite version of Doom (at least until the PSX), but not that the same was true for Wolf. Makes sense though, it really is an excellent version. Even with the Doom-style additions. I was just playing the Jaguar version for a couple of hours this morning. It is a fun, great-looking version.